Selwood is renowned for being an industry leader in health and safety and the company’s problem-solving abilities in this area came to the fore in a sewer work application. 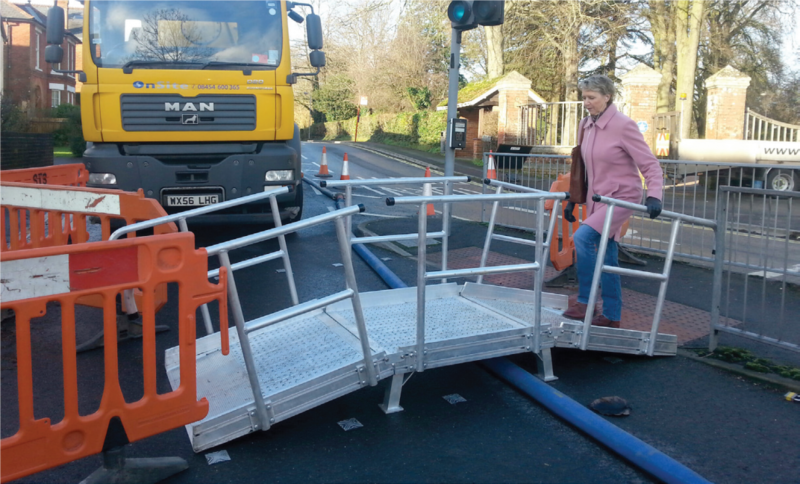 A challenge was presented when water and wastewater specialist OnSite called upon Selwood to provide a solution for the public to be able to walk safely on a pedestrian footpath while sewer work was carried out at a very busy traffic junction in Salisbury, Wiltshire. The task presented specific demands. Selwood had to provide a safe way for pedestrians to be able to walk over temporary overland pipework connected to their pumps while dealing with incoming flows from the sewer main. This had to be done while OnSite carried out sewer relining work. A safe, lightweight, easily transportable and economical solution was required. Following extensive research, Selwood’s specialists found a specialist manufacturer that was prepared to help with designing and building the pedestrian ramp. Bespoke design drawings were produced to be approved by both OnSite and Selwood specialists in advance of supplying the ramp. The first Selwood pedestrian ramp was built and supplied to OnSite for trials. After initial trials were conducted, both OnSite and its client Wessex Water agreed that the concept worked very well. Selwood prides itself on a bespoke service and, following feedback from OnSite, a couple of minor amendments were made to the design to reduce assembly and dismantling time. The service was backed by Selwood’s commitment to quality and safety, exemplified by its many industry accreditations, including Achilles UVDB and Safecontractor. The Selwood ramp was the optimal solution for the challenge – meeting all health and safety requirements for the public and being quick and simple to assemble and dismantle. Its lightweight aluminium construction and the fact that it was supplied in sections made the ramp very easy to transport. Ultimately, Selwood’s cost-effective solution saved the client time, money and labour as the alternative would have been to dig a trench and bury pipework or construct a temporary pipe bridge. Phil Ingleheart, Framework Manager for Selwood, based at the Weymouth branch in Dorset, said: “We were delighted to offer a robust and safe solution for OnSite, a company with whom we have a very close working relationship. “Both our companies have worked together to provide innovative solutions to water companies throughout the UK and the first Selwood pedestrian ramp was a prime example of this teamwork. For more information on Selwood’s quality and health and safety accreditations, click here.